You guys, it's the middle of September and I have not yet decorated my house for fall! 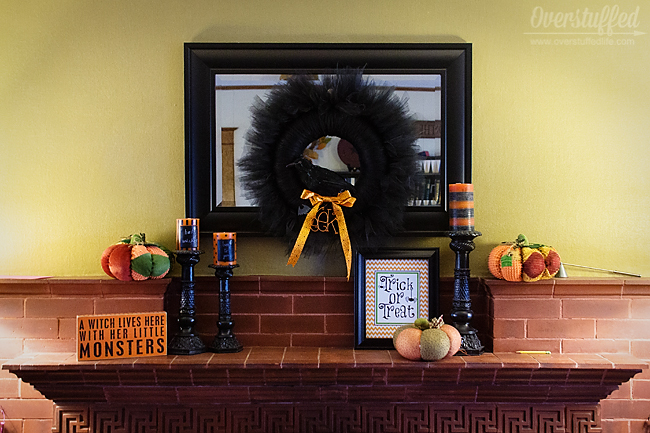 And I'm thinking I might just skip the fall decor all together and move straight to Halloween! This weekend we are headed down to Stake Conference, and I am so excited to go to real craft stores that are not WalMart! I thought I had shared all of my Halloween decor from last year, but I found a couple photos that I never posted, and since I am totally in the mood for Halloween decor, I'm posting them now. Let's play I Spy! I spy something pink that doesn't belong on the mantel. I also spy something yellow that doesn't belong there, either! Do you see them, too? I obviously didn't have my I Spy skills very sharp when I took this photo! Those beautiful kids of mine, always leaving stuff where it doesn't belong. Good thing I love them so much! Anyway, my favorite part of last year's mantel was my wreath. 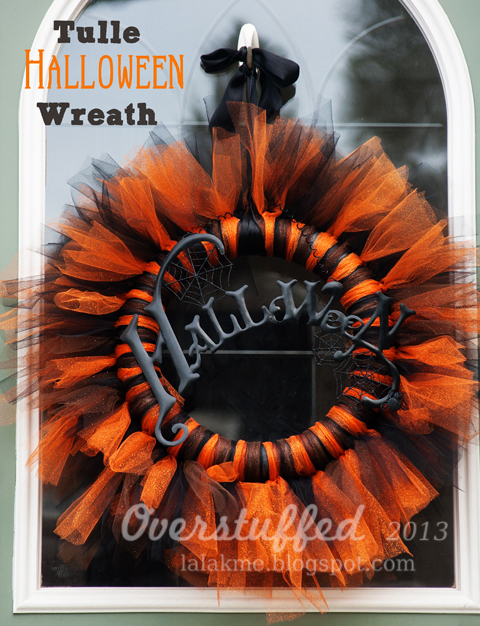 For both wreaths, I added random Halloween decorations to them once the tulle was tied on. For this black one, I hot glued a very annoying crow that I ruined after ripping its batteries out to stop the madness. On the wreath, you can't tell that he only has one foot. Plus, now that he doesn't have any batteries he is quiet. I also added some cheap Halloween ribbon from the dollar store and a little "eek" metal sign that I have collected along the way. I love how it turned out! For my door wreath, I added another metal Halloween sign that I had in my Halloween bin. It's always been sort of annoying to hang anywhere, but on the wreath it worked perfectly! Don't be afraid of repurposing some of the random decor you've gathered over the years and giving it new life! 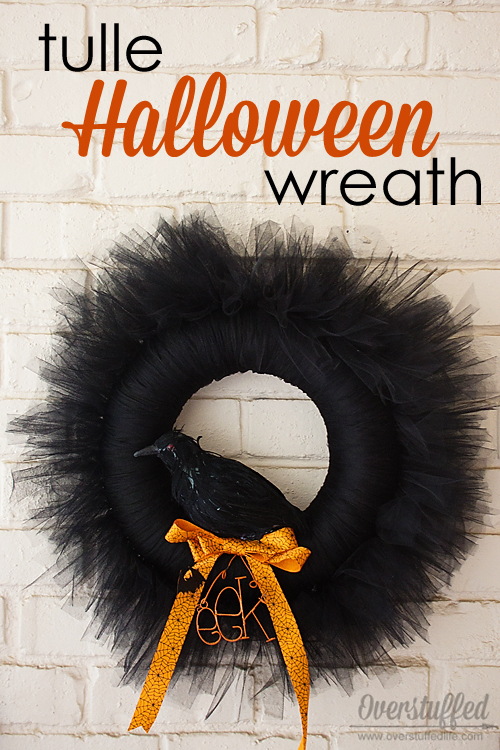 These wreaths are so cheap to make and adding things you already have on hand helps you stick to the budget further. This year, I might make a purple and green one. What do you think? 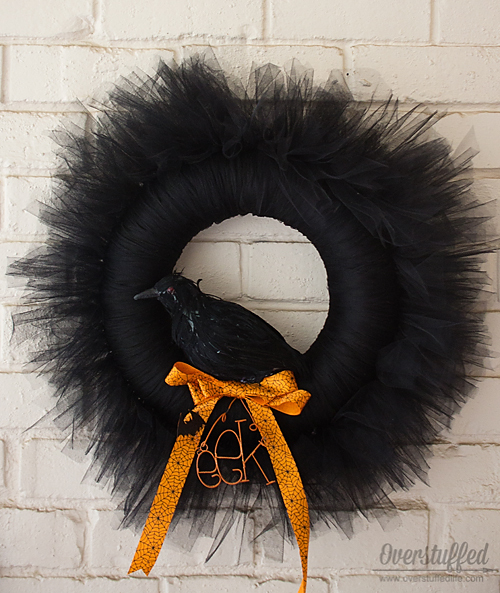 See more of my tulle Halloween wreaths! I am in serious love with both of your wreaths Lara! Pinned for inspiration!! I absolutely love wreaths. Both making them and simply displaying them but I never thought about using tulle. These are super cute and I think I'm definitely going to give tulle a try. Thanks, Kathe! They are so easy to make--and tulle is pretty inexpensive, too. Win-win-win!